The Swedish and Norwegian Tomte (or Nisse as they are known in Denmark) live in forests, barns, or houses and are always easily recognizable by their distinctive red pointed hats. This particular little Tomte (he does not have a long white beard, so he can only be a young Tomte) is knitted in exactly the same way as a traditional Nordic mitten: in the round using five double-pointed needles, with a decorative braided cast-on, stranded-colorwork patterning, and traditional peasant thumb openings for his arms. His pointed hat has a twisted braid detail and is shaped in the same way as the top of a mitten. 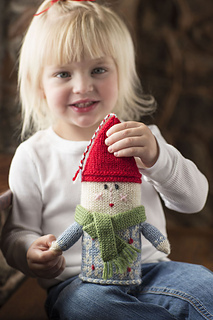 yarn can be used to knit Little Tomte; you just need to follow the suggested tension of whichever yarn you use. 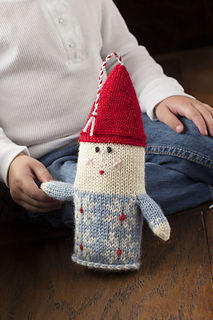 A finer yarn will make a smaller Tomte, which would look lovely as a festive ornament. Needles Set of 5 size 3 mm (no equivalent; between U.S. sizes 2 and 3) double-pointed (dpn). Adjust needle size if necessary to obtain the correct gauge. Gauge 24 sts and 26 rnds = 4” (10 cm) in chart patt after washing. 24 sts and 30 rnds = 4” (10 cm) in St st after washing. Notions Marker (m); waste yarn; pure wool for filling; tapestry needle.